New Page — J.A. Green Development Corp.
JAG Logistics Center at DIA located directly south of the airport, will be built in a confirmed opportunity zone. Ever since opportunity zones were added to the tax code by the Tax Cuts and Jobs Act on December 22, 2017, investors, property owners and developers alike have been scrambling to make sense of the new law to better learn how to take advantage. An opportunity zone is defined by the IRS as an economically-distressed community. Created as an economic development tool, they are designed to spur economic development and job creation in distressed communities. According to the IRS, investors can defer tax on any prior gains invested in a Qualified Opportunity Fund (QOF) until the earlier of the date on which the investment in a QOF is sold or exchanged, or December 31, 2026. According to a recent Cushman and Wakefield national report, investors should look for areas with strong job, income, population growth and CRE market fundamentals and/or where economic revival is beginning to take place. Needless to say, Denver meets a lot of those criteria. “I think you’re going to see a flurry of activity between now and the end of June while investors are looking to place money into funds, and then there will be an additional flurry of transactions happening in the latter half of the year for opportunity zone plays,” says Alec Rhodes, managing director at Cushman & Wakefield in Denver. His team has positioned itself as the clearing house for connecting developers and buyers with fund equity. Chief Development Officer Celeste Tanner of Denver-based Confluent Development, has more than 11 years experience in development and real estate and knows a thing or two about opportunity zones. She has played a key role in the ground-up development of more than 2.5 million square feet of commercial and multi-family space. “While Denver’s economy overall is certainly booming, I am hopeful that certain types of investment in opportunity zones can help mitigate some of the risks to Denver’s overall economic growth, such as more affordable housing, increased accessibility to healthy food sources and better investment in smaller businesses,” says Tanner. Due to the nature of the rules for opportunity zone investment, Tanner predicts that individual, ground-up development projects will be the primary investment vehicles for capital in 2019, with several strong investment options in the Denver metro area. Reonomy data indicates that there are approximately 4,800 different assets situated in Denver’s opportunity zones, and nearly a quarter of those are categorized as multifamily properties. Rhodes explains that given the structure of the legislation, it’s easy to make sense of revitalizing a multifamily property as it is ultimately easier to improve multifamily than it is industrial property. That being said, Rhodes predicts that there will be more activity on the industrial side, where there is additional land to go vertical. “There’s quite a bit of activity out by the airport in Aurora. There is a pretty vast swath of land that all falls within an opportunity zone. There is also a good amount of opportunity central [Denver]. You will probably see mixed-use opportunity zones more central and industrial opportunity zone activity further east,” says Rhodes. 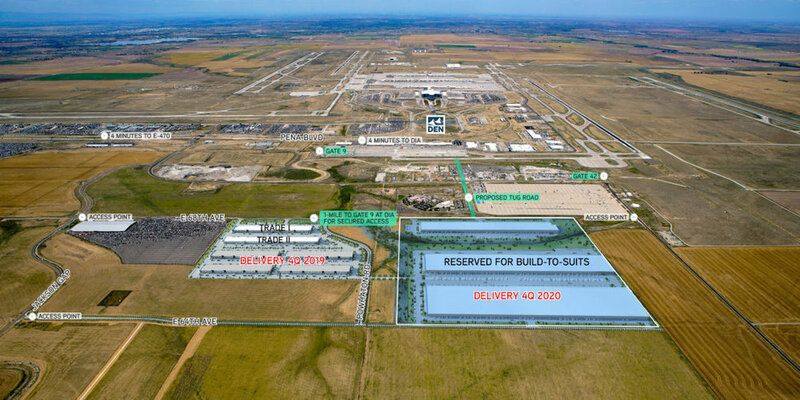 The JAG Logistics Center at DIA located directly south of Denver International Airport will be built in a confirmed opportunity zone, in fact, the project is is one of the first opportunity zone developments in the country. Scheduled for delivery in 2020, JAG promises to be one of the most compelling and strategic business parks in Colorado, providing the closest and most direct access to the airport cargo tarmac of any current or future business park around DIA. Encompassing approximately 250 acres of commercial and industrial zoned land, JAG Logistics Center at DIA is developed, owned and managed by J.A. Green Development (JAG), a family owned and operated business since 1941, with extensive expertise in airport adjacent development. Phase I, containing approximately 1,000,000 square feet of warehouse and mezzanine space, will offer maximum flexibility to its occupants. Delivery of the first two buildings, each measuring approximately 180,000 square feet are expected in Q4 2019. While it remains a difficult task for any CRE professional to definitively predict how Denver’s CRE economy will fare in 2019, Colorado’s economy remains diverse. Development activity in office, industrial and retail are all witnessing active construction pipelines entering into 2019. Opportunity zones add another layer of demand to an already flourishing economy. “The state has done an amazing job in the last 10-15 years in diversifying its core industries, supplementing oil and gas with tech, aerospace, financial services and many others. As a result, I am confident that Denver has achieved a newfound stability relative to prior boom and bust cycles, and while certain product segments appear to be reaching a saturation point, I am not seeing any major indicators that we are grossly overbuilt in any product. Even if 2019 results in some overall slowing in the CRE market, I believe Denver is poised to manage any “typical” slowdown and remain an overall viable investment opportunity in real estate,” explains Tanner.